St Mary's Headland includes the Seaham Hall - St Mary's - Vicarage complex and the land eastwards to the sea. 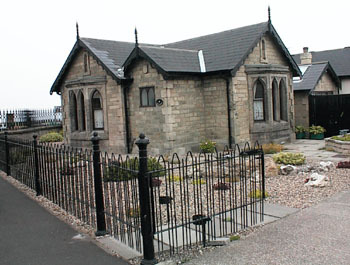 It includes Seaham Hall Lodge which is located at the entrance to the Seaham Hall grounds from the coast road at Seaham Hall Beach Car Park. Home of the Chapman family. 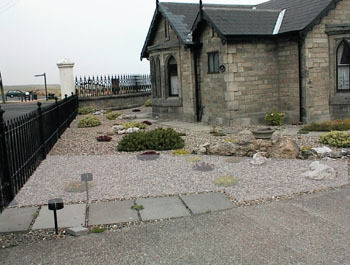 In March 1997 an archeological excavation was commissioned by the Durham County Archeologist and undertaken by Northern Archeological Associates in the front garden of Seaham Hall Lodge. The lightened area of garden is the approximate location of the "dig". Opposite entrance to Seaham Hall grounds is the Beach Car Park. to the right of the white pillar. The purpose was to clarify the findings of various historical reports of human burials in this area to the north of St Marys Church. In the past speculation about the origin of the burials found in the area has ranged from ancient Britons to Vikings. The remains of ten skeletons were uncovered by the "dig" in a small area 7m x 3m (lightened in the picture above). Bone samples taken from the skeletons were used for radiocarbon dating - a scientific technique for determining how long the skeletons had been buried. The conclusion of the scientific dating is that the cemetery was in use between AD660 and AD880. This makes the burials older than St Marys Church and from a time in history when the Celtic Christian church had yet to be supplanted by Roman Catholicism. Remarkably, it makes the site possibly even older than Jarrow and Monk Wearmouth and places Seaham as one of the earliest Anglo-Saxon Christian sites in England. The intention now is to carry out further investigative work on the site and grants have been obtained from several sponsors, including Seaham Town Council, to fund the initiative. Whilst this isn't exactly a regeneration project it could have significant value in terms of the town's heritage if the early indications are confirmed. Therefore, Seaham Harbour Online intends to monitor the "dig" and report any interesting findings.